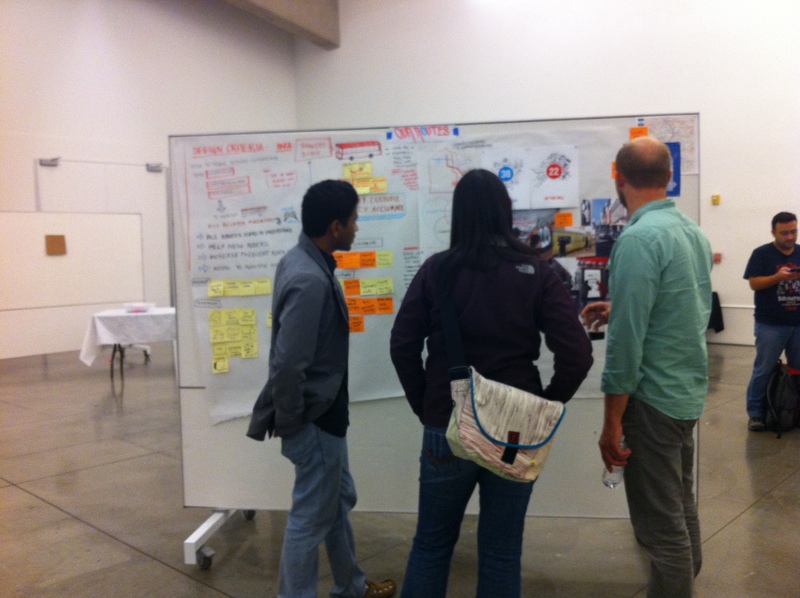 The San Francisco Mayor's Office of Innovation recently piloted an “unhackathon” which attracted over 80 designers, technologists and business pros, all collaborating quickly and intensively to create viable solutions for the City’s taxi distribution and transit communication problems. This process, built on the central tenets of design thinking, proved as successful in innovating city management as it has for private industry. The mayor chose Jay Nath to be the City’s first Chief Innovation Officer and charged him with achieving the portfolio’s ambitious goals. In accepting this position, Jay knew one of his biggest challenges would be identifying and experimenting with cutting edge approaches that could inform and engage the many agencies and professionals responsible for managing city government. Fortunately, he didn’t have to look far: San Francisco is less than an hour north of Silicon Valley. It’s home to thousands of startups, incubators and venture investors who reinvent for a living. It’s also home to several top universities including California College of the Arts (CCA), a leader in design innovation. All Jay needed to do was open his door and invite collaborators to come in. While San Francisco is hugely popular and much loved by its citizens, it shares problems common to many large cities around the world. When the City’s decided to collaborate with people in the community, its invitation attracted many partners familiar with its challenges and eager to help solve them. Community leaders, large corporations, individuals and associations all pledged support and suggested ideas. Jay and his colleague, Shannon Spanhake listened attentively to all the proposals, but they were particularly interested in testing the power of design thinking and its ability to solve problems and influence behavior. They believed it might work as effectively to reform government as it has industry. To that end, they were intrigued when local incubator Mix & Stir Studio proposed a design-oriented “Unhackathon” that could be hosted at CCA. Mix & Stir co-founders explained that an unhackathon could bring together designers, technologists and business pros for an intense session of ideation and cross-discipline collaboration focused on challenges or “pain points.” Participants would be briefed on the problem, presented with any constraints, then supported through the process to come up with viable, desirable solutions. Mix & Stir’s approach could create the same rapid innovation, creativity and fresh thinking common to the traditional hackathon model, however this variation would be more holistic, requiring that design and business considerations be integrated into the technology. Mix & Stir argued that this requirement, coupled with a strong user focus, was in keeping with design thinkings key tenets and was more likely to generate practical solutions with broad market acceptance. Intrigued, Jay asked how and when this approach could be piloted. Mix & Stir explained that all the City needed to provide was a problem. The studio, along with the event participants and CCA, would do the rest. An “unhackathon” could be scheduled roughly 4 weeks from the time Jay and Shannon identified a challenge the event could address. At any time, 50% of the cabs in San Francisco sit empty. They cluster in key areas of the city, even though they’re needed in other locations. Central dispatch hasn’t worked nor has the current “free market” approach. How can we take advantage of today’s technology and create a solution to distribute taxis throughout the city, where and when they are needed, so everyone benefits? San Francisco needs to communicate transit information in real time with its citizens in a variety of locations. How can we create a digital system to provide “real time” transit information when and where its needed in an efficient, effective and affordable manner? Since these problems are common to almost any global city, Mix & Stir believed they would appeal to the area’s startup talent pool. By identifying a viable and commercially successful approach for San Francisco, the winning concept would be free to scale their business to other metropolitan areas. With that encouraging rationale, Mix & Stir quickly conceived” Unhackathon #1: The Taxi and Transit Challenge” and got to work making it a reality. Experiments like this require commitment and agility, particularly when they are done on a tight schedule. Fortunately, those qualities were in steady supply from all parties. Jay and Shannon lined up representatives from the City’s transit department who had a direct interest in solving these challenges. The representatives each drafted 1-page problem statements outlining key details and they released relevant data sets participating teams could review and use. They also reached out to the area’s leading transportation experts, encouraging them to share their expertise and mentor the teams. Meanwhile, Mix & Stir used its network to spread the word about the event, encouraging support and participation from leading design agencies, tech companies and business professionals. In short order, IDEO, Google, Twitter, Hot Studio, ESRI and many other similar organizations pledged to send participants. To add a youthful perspective, CCA program chairs promoted the event to their top students in the school’s Design MBA and Interactive Design programs. Interested participants signed up through the invitation page on EventBrite, an online event management site. Unlike most hackathons, these participants paid to attend. This decision - to insist on some level of payment - went against the prevailing ethos and caused initial concern. Why would anyone want to donate their time and talent to the City if they had to pay to do so? Mix & Stir argued that a modest payment would indicate commitment by the participant and would convey that the experience itself had value. The City agreed to try but still feared it would limit participation. Fortunately, Mix & Stir’s contention proved correct. The event sold out within a couple of weeks. On the first night of the two-day event, 80 attendees crowded into CCA’s Timken Hall to hear a panel of taxi and transit communication experts. The taxi panel included a representative from the city, a dispatcher, a top city taxi driver and the CEO of a taxi hailing software startup. The transit panel similarly included city representation, a expert on integrating data into cities and a public signage specialist. The audience listened carefully to the experts’ advice and information, asking questions to clarify points or provide feedback on ideas. After approximately 2 hours of focused attention, everyone was invited to a cocktail party to discuss the problems, potential concepts and to form their ad hoc teams. The following morning, 11 newly configured teams showed up for breakfast. 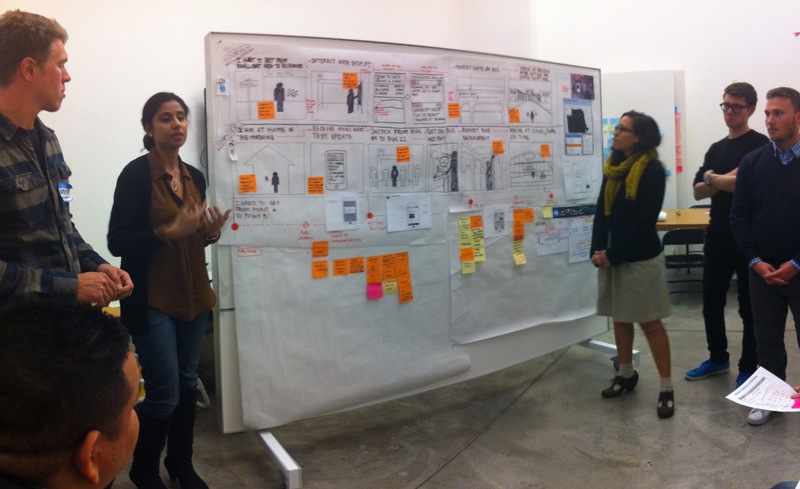 They were assigned a work studio and provided with supporting material like colored markers and Post-It notes. They were given a list of judging criteria and offered mentors who would visit their studios to help with problems like technical specifications, branding or business models. The teams worked through the day, with brief breaks for meals and an impromptu visit from Mayor Lee to thank them for their contributions. At 4pm, a team of judges (mostly comprised of city officials) visited each team to hear their 5 min. pitch and ask any questions. By 7pm, every teams’ visually depicted concept was on display in the college’s central gallery for all to see. The judges had deliberated and chosen their favorites and Mix & Stir had awarded cash prizes to the top two concepts. The common experience conveyed by all participants was a combination of exhaustion and exhilaration. The event produced far more viable ideas than the City expected. Long-time traditional practitioners were stunned and delighted by the outcome. Students were thrilled to have worked alongside experienced pros, and senior agency talent were grateful for a way to “give back” and make a difference. Jay and Shannon, along with their colleagues in the taxi and transit departments, arranged for the winning ideas to be presented in City Hall within a month of the event. Elements of all the concepts informed and revised the RFP process, adding innovations that would not have been considered if the event didn’t happen. In total, from initial discussions to impact on the City’s procurement process, less than 3 months had passed. It is too soon to have quantified metrics on the benefits of this approach. The City estimates it will take from 6-9 months for the changes generated by the first Unhackathon to be implemented, and the true impacts will take longer to evaluate. But the qualitative metrics are already evident: City management is impressed with the process and its outcome; participants were pleased with the interaction and its benefits to them personally; sponsors were delighted to be associated with such a practical and targeted event; CCA was eager to sponsor the next Unhackathon (which they did about a month later in a collaboration with the TED Prize). Beyond the specific benefits of the Unhackathon, city officials gained an appreciation for the speed, quality and relevance design-oriented approaches can deliver. The Mayor’s Office of Innovation can demonstrate their success with the taxi and transit communication challenges, and can encourage other departments to consider similar activities for other problem spots. Now instead of agonizing over budget limits or personnel shortages, the conversation can instead focus on identifying the right partners in the private sector and defining the problem in a way that motivates viable solutions from professionals within the community. Funding - the City had no budget to fund the event. The ticket price covered only half of the expenses and since the approach was novel, sponsors were a hard sell. To counter this, individuals from Mix & Stir as well as the city’s Office of Innovation reached out through their personal networks to identify partners who could easily recognize the event’s value and offer sponsorship. Mix & Stir made up the difference, reasoning that it was good PR for its own goals. Cross disciplinary collaboration - getting people of different backgrounds, vocabularies and perspectives to work together is neither easy nor natural. To assist, the event leaders provided a clear process to follow, with interim milestones tied to time of day. Also, an HR specialist volunteered for the day, visiting each team and observing how they worked together. Whenever she saw a problem brewing based on personal interactions, she interceded and helped them reach consensus. Attracting the right mix of participants - When an event is open to the public but has limited capacity, it’s difficult to get the mix of participants right. The invitation attempted to manage this by requiring participants to declare their skill set when they registered (Designer, Business Pro, Technologist). It set limits for each category. When a category sold out, no more tickets would be available for that skill set, but tickets would still be available for other categories. Working with a bureaucracy - city government is a bureaucracy which can often mean slow, timid and overly political responses. In this case, the solution was having a central contact - Jay Nath - whose stated role in the City is to take a fresh look, conduct experiments and make decisions in that role. Ensuring participants are informed about the problem, its causes and its constraints - Putting uninformed people to work on your problems rarely works, no matter how talented they are. After registering for the Unhackathon, participants were connected to an event page that provided the problem statements and links to data sets. They were encouraged to study the problem ahead of time and to review other city’s attempts at solutions. The panel of experts provided great depth in a more customized way, answering questions and sharing insights. Finally, the mentors helped to shape and refine concepts in ways that were directly relevant to the problems. 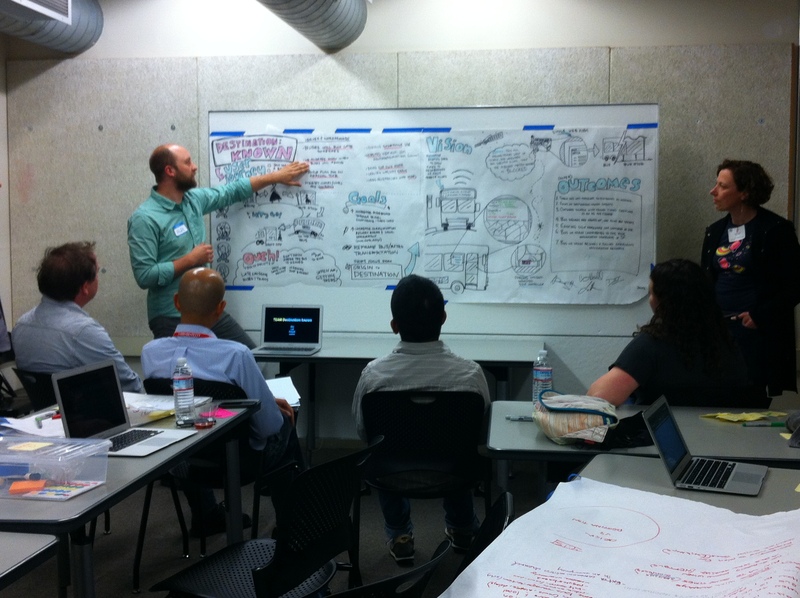 Really great to see design thinking and hack management practices brought to city government.